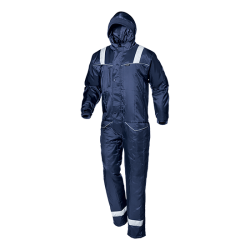 Coverall specific for cold store operators, it is suitable for working in low temperatures down to -45°C. 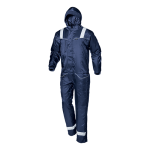 Outer fabric in 420D Oxford nylon and padding in Thinsulate 3M, 150 g/ m². 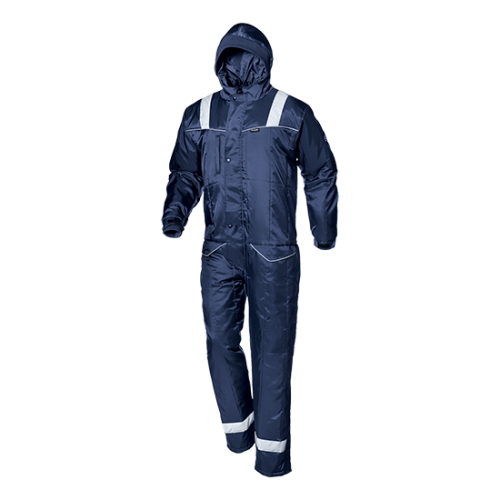 Concealed zipper closure with flap and snap buttons, hood, cuffs adjustable with Velcro and inside cuffs in elastic knitted fabric; chest pocket with zipper, two side pockets with flaps and Velcro, elastic waistband, inner pocket with Velcro, reflective bands on the shoulders and under the knee, reflective piping on pockets’ and shoulder pads’ outlines.